The Luxury flybridge Motor Yacht, 'Burjuman' was imported from Italy. She is fitted with 2 staterooms and a double children's room, 4 bath-showers, a lounge and dining area, galley, AC throughout, plus crew cabin. The interior is beautifully appointed and maintained and has every creature comfort you would expect for the perfect day out or several days and nights out at sea. 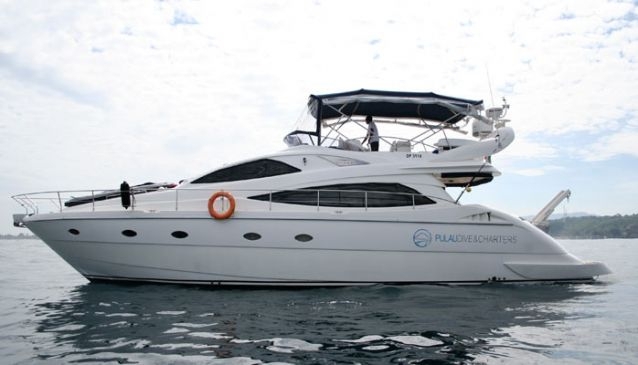 Whether you want to dive in style, sail out to the big surf in luxury, or just take all your family and friends for a perfect day charter to Bali's beautiful waters and islands, our Aicon was built to provide the most memorable day on your holiday. Dive over the side, snorkel in the crystal waters of Bali, Lombok or the Gilis, then come back on board to some chilled champagne and delightful eats. From Benoa Harbour, you can take a Surf Charter ($2800) and surf the East Coast of Bali, or the big breaks off Uluwatu, or Lembongan; or dive of any spot where the experts say you will see your fill of some of the 952 species of marine life around these waters.